For a fun Valentine’s Day brunch, may we suggest the casual combination of two of our past posts? We tried this idea out last week, and it was quite tasty. And really, other than chocolate and roses, what says Valentine’s Day more than strawberries? What are the two posts in question, you ask? Why, they would be Lemon Ricotta Pancakes with Blueberry Sauce and Whole-Wheat Pancakes with a Strawberry Sauce. But, in honor of February the Fourteenth, we drop the lemon and the blueberry sauce from the former recipe, and abscond with the sauce from the latter. 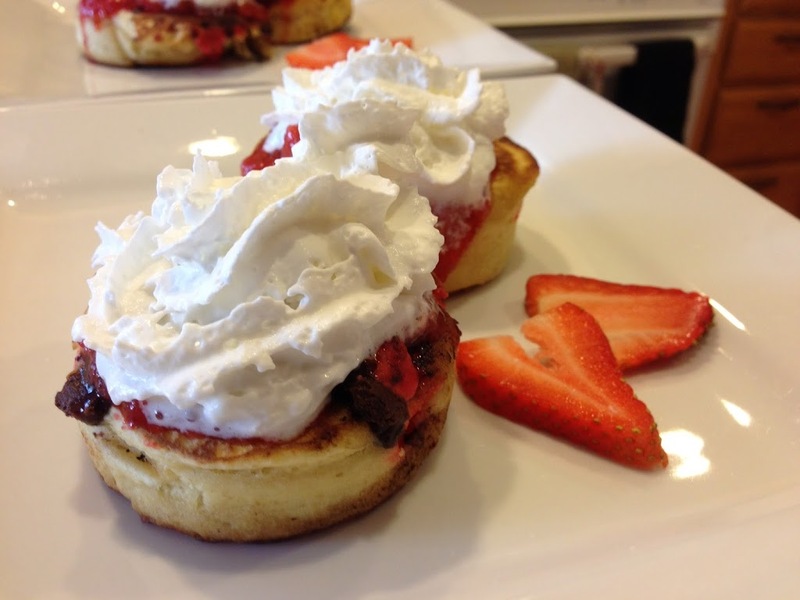 Voila – Ricotta Pancakes with Strawberry Sauce! I did make one small change in preparing these pancakes. Rather than the large stack of “flapjacks” that look so appetizing in the original lemon ricotta recipe, I used my egg rings to prepare small, round, thicker “cakes.” The result was quite pleasing to the eye, and also interesting to eat. The outside of each cake was lightly crisped from being fried in butter, but the inside was warm and moist with the flavor and texture of the ricotta. And, just for fun, I sprinkled pink chocolate chips on top of the whipped cream before serving this to my daughters. They didn’t mind a bit. Who knew? 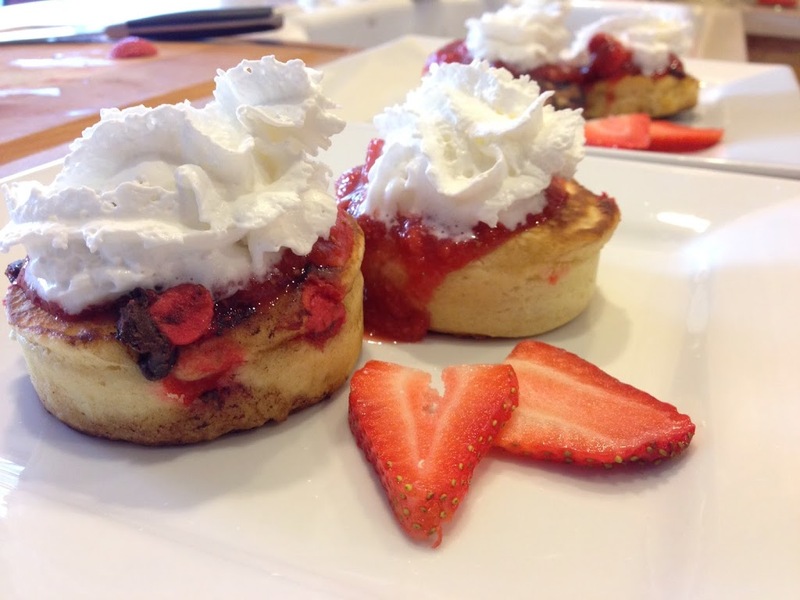 Make these delightfully light and moist pancakes for a Valentine’s Day brunch, or perhaps just to add a little warmth to a weekend family breakfast. In a medium sized bowl, whisk together ricotta cheese, egg, egg whites, and oil. Gently fold the wet mixture into the dry mixture until the flour disappears. Don’t over mix – the batter will be thick. Heat a griddle or large pan over medium heat. Melt a tablespoon or two of butter into the pan. If using egg rings, spray the inside of each ring with non-stick cooking spray, place in the pan, and fill about halfway with batter. If not, drop 1/3 cup of batter into pan for each cake. Allow to cook on each side for 2-3 minutes, or until golden brown. Meanwhile, puree strawberries into a chunky puree. Heat them in a small saucepan over low heat until warm. Stir in lemon juice and maple syrup. Keep cakes warm on cookie sheet in oven heated to lowest setting (usually 170 to 200 degrees) until ready to serve. Top with strawberry sauce and whipped cream, and garnish with additional strawberries as desired.